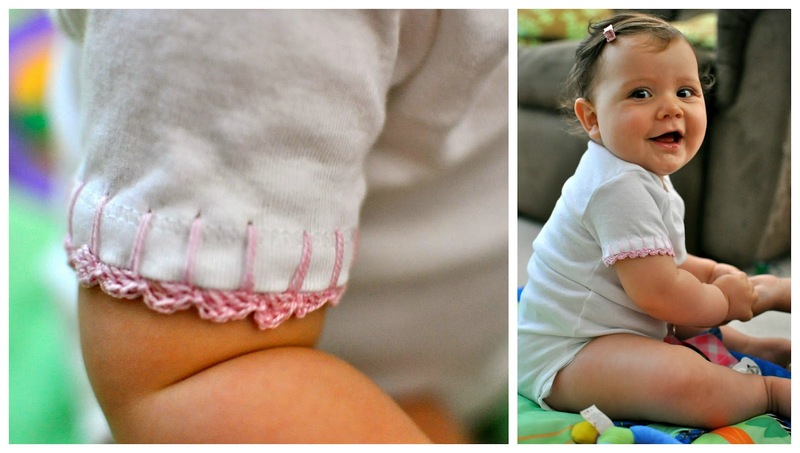 Crocheting on the edges of clothing is not new to me, it was something my mom used to do to my clothes when I was a little kid, so having the ability to do something to my daughter like my mom made for me fills my heart right up with joy, because my mom passed when I was only 8 years old and things like this are part of the sweet memories I have. What you will need: a onesie or any piece of clothing you wish to put a crochet edge on (I bought a pack of 5 Carter's onesies for $6.99! ), a 1.25mm crochet hook or smaller and some size 10 cotton crochet thread. Hold the yarn behind the fabric and then carefully (so you aren't left with huge unattractive holes) poke a hole with the hook, just under the sewn edge that goes around the sleeve. Chain 3, poke another hole and repeat. Just make sure you are spacing evenly. Once you have gone all the way around join. Now make one round of your favorite edging stitch, I really like the scalloped look (chain 2, 2 dc, slip stitch, repeat) , but a picot is a good option, too. I LOVE that idea!! Perfect for the baby shower I'm going to this weekend! Thank you for the edge toutorial, God Bless you dear.